I've mentioned before here on the blog that I'm a newbie Pyrex collector. I love the colours, geometric designs, and general nostalgia surrounding the stuff. I hit up the local Goodwill a couple times a month, only because I pass it every day on my way home from work. I haven't had much luck in the baking dish or mixing bowl department lately, but I made some fun finds of some other pieces! The pattern on these mugs is called Old Town Blue. They were 99 cents each. They remind me of my Granny - she had the same pattern. I miss her. This pattern is known as Butterfly Gold. 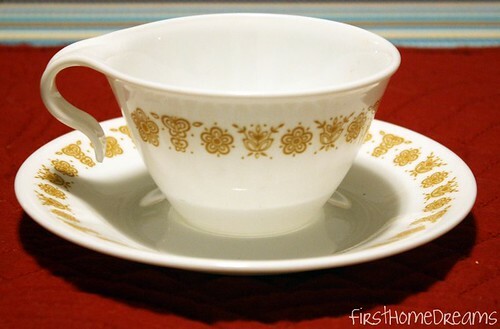 Each piece of this cup and saucer set was 99 cents. For some reason, they weren't displayed together in the store. In addition to Pyrex, I'm a big fan of old glass fruit jars. When I see them in antique shops, they usually range from $5 - $10 depending on the size and colour. I snagged these lovelies for $1.51 each! 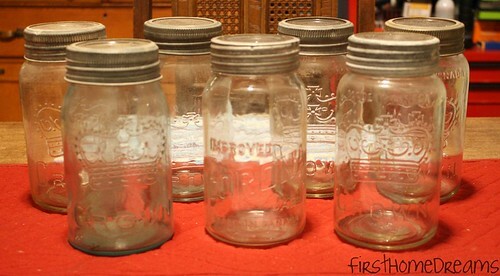 There was an 8th glass jar, but I left it behind because it didn't have the nice glass lid that these ones all have. My favourite is this turquoise jar. In addition to being turquoise, it also has bubbles in the glass, the sides are wavy rather than smooth, and although there are seams in the sides, they are no where near as clean as those of the other jars. 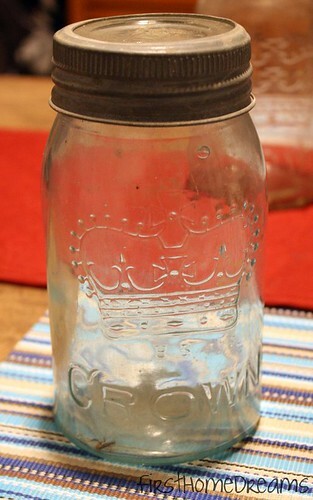 I'm not sure how to date these Crown fruit jars. Each of the glass lids has a two digit number embossed in the top, and I'm wondering if that indicates the year. The turquoise jar has a 19, and the remaining jars range from 40 to 82. I love that the zinc rings are all in wonderful shape. I found a broken Crown jar when digging in the dirt from where the shack had stood, and there was almost nothing left of the ring. 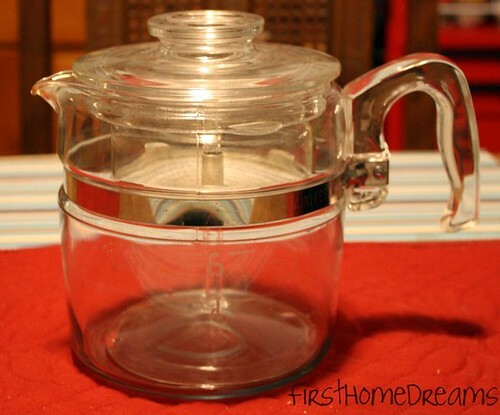 I'm linking up to Her Library Adventures Pyrex Party!